patient information into messaging and alerting applications. 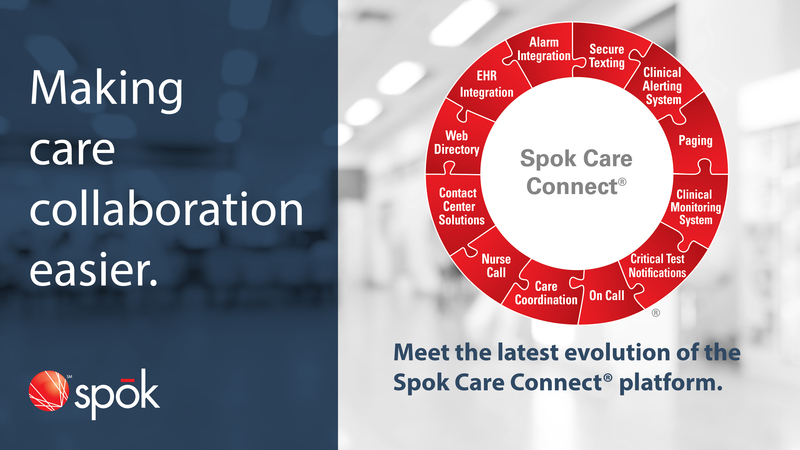 next evolution of the Spok Care Connect platform,” said Vincent D.
Kelly, president and chief executive officer of Spok Holdings, Inc.
clinicians focus on what they do best—taking care of patients. will introduce frequently requested customer self-service capabilities. smartphones, and Windows and Mac desktops. person. Available now for nurse call workflows. navigate their health system experience. officer at Peninsula Regional Medical Center in Salisbury, Maryland. and book a demo or meeting at spok.com/HIMSS. information, visit spok.com or follow @spoktweets on Twitter. Mobile are trademarks of Spok, Inc.